Movie Review- Jack Reacher — Always Packed for Adventure! Jack Reacher begins with the point of view of a sniper as he takes out five people on a river front promenade in Pennsylvania. It's tense and the tension doesn't stop through this action packed thriller. Admittedly, there are moments where the plot feels like a movie of the week on Court TV and despite the riveting opening sequence, it took a bit to get going. However, once it drew me in, I was sold. 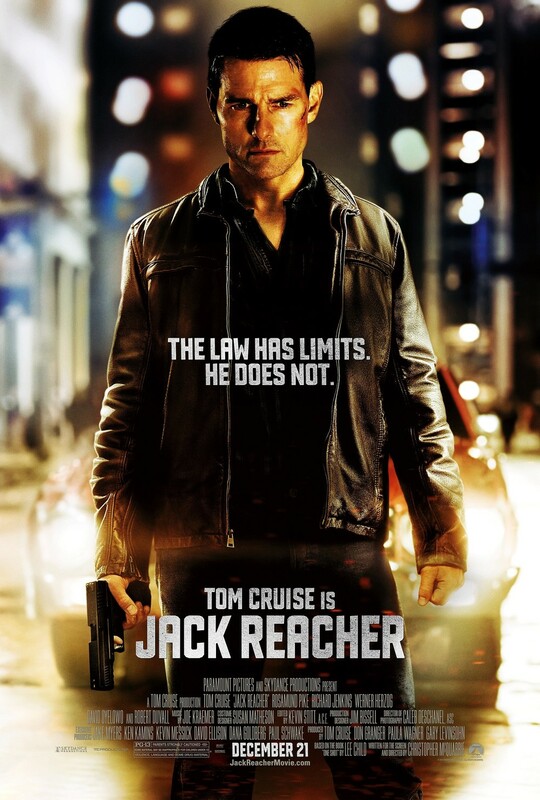 Tom Cruise is great as Jack Reacher, a former military police officer, wiz crime solver and current drifter. He is a man who enforces the law, by floating above it. I loved Robert Duvall as a the range owner. Duvall stole every scene that he was in. The casting director did a great job with finding guys who looked most like stereotypical Russian thugs to play the part. The movie revolves around broad character archetypes and works. It's plot movie, not a character driven drama. The action sequences in Reacher are some of the best that I have ever seen. I caught myself holding my breath, because they were so exciting. I really appreciated that they were not overdone. They managed to pull off an extremely exciting car chase without explosions, cars catching air time or flipping over. It was just a good, old fashioned car chase. The fight sequences were the same way. They were incredibly brutal, but they never crossed over to being absurd. The guys got winded and the fights ended fairly quickly. All of the action was rooted in realism, making it far more entertaining and unpredictable. This movie is violent, very violent. Almost violent in a Quentin Tarantino way, just shy of that brutal. I can handle violence and gore, but I cringed a lot during the movie. Much of the violence is implied and I have a very vivid imagination! Paramount Pictures really missed the mark with the release date. Yes, it's very unfortunate that this movie came out the same time as Sandy Hook, but that's not why it underperformed at the box office. This is not a Christmas movie. This is not an Oscar contender and it just can't compete with onslaught of movie choices that come out this time of year. Jack Reacher is more of a summer movie. If it had been released appropriately, it surely would have been first at the box office and bigger money maker. The movie is really well done and highly entertaining, it has the unfortunate fate of being swamped by heavy competition.